Very gourmet yet simple to make. Substituting 1 c. chopped scallions for the diced onion cuts down the frying time and gives a nice aroma - just add directly to the egg mixture. Freshly chopped herbs can also be added such as dill or basil for a fragrant aroma. 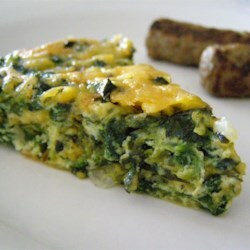 If using fresh spinach instead of frozen, use 8 c. washed and chopped. Excellent!